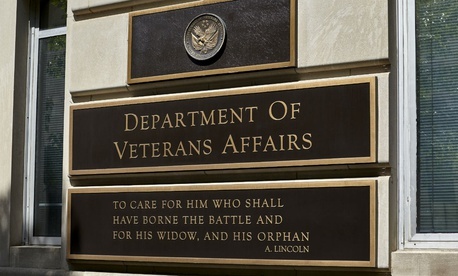 A former Veterans Affairs Department employee was sentenced last week to 11 years in prison after pleading guilty to accepting bribes to direct former military personnel to organizations fraudulently claiming to offer more training than was actually available. James King was a Vocational Rehabilitation and Employment program counselor and from 2015 through 2017, the Justice Department said, he “demanded and received cash bribes” from three different schools offering various services to veterans. As part of his job, King was responsible for advising veterans about which school to attend and facilitating payments to those organizations from VA. The three organizations in question paid King in cash a 7 percent cut of all the money they received from VA as a result of his recommendations. All told, King, a 63-year-old from Baltimore, directed more than $2 million to the schools paying him bribes. In addition to his 132-month sentence, King will also pay $155,000 in restitution to VA. Three officials from two of the schools, Atius Technology Institute and Eelon Training Academy, were sentenced to prison time and fines last week. VA launched a “fact-finding inquiry” into Atius in February 2017 based on complaints by students about “the quality of education at the school.” King subsequently falsified a site visit at Atius and later tried to convince its owner, Albert Poawui, to lie to a grand jury. Poawui was wearing a recording device government investigators had given him when King suggested Poawui tell law enforcement a payment he had made to King was simply reimbursing him for a computer. In addition to accepting the bribes, King admitted to “repeatedly lying to veterans” about their options and the benefits of the various schools. He told one veteran with a disability, for example, he had to attend a school specializing in physical security classes or else the veteran would lose access to his benefits. The veteran had enrolled in the vocational program to “pursue his dream of becoming a baker,” the Justice Department said. In another case, King enrolled a veteran in a health practitioner school at Eelon Wellness and Massage. The school did not actually exist and the veteran was its only student. King entered into a plea agreement and waived his right to a trial by jury in October 2018. The FBI and VA IG said the findings with regard to King are part of an ongoing investigation. His indictment cites other unnamed individuals and public officials as complicit in the crimes. Jessie Liu, a U.S. attorney in Washington, D.C., said King “blatantly betrayed” his duties as a federal employee at VA and to veterans who turned to the department for assistance.